Bharti Singh and Harsh Limbachiyaa are set to tie the knot on Dec 3 in Goa. Punjabi khudi Bharti Singh and Gujju boy Harsh Limbachiyaa are on cloud nine. The couple are quite excited for their wedding. The countdown has begun as the destination wedding is just 2 days away. Bharti have taken up all the responsibilities to make her wedding a memorable one. After a pre-wedding photo-shoot and a romantic pre-wedding video, Bharti Singh and Harsh Limbachiyaa are here to capture every moment of their life and unfold their wedding into web series called Bharti Ki Baraat. 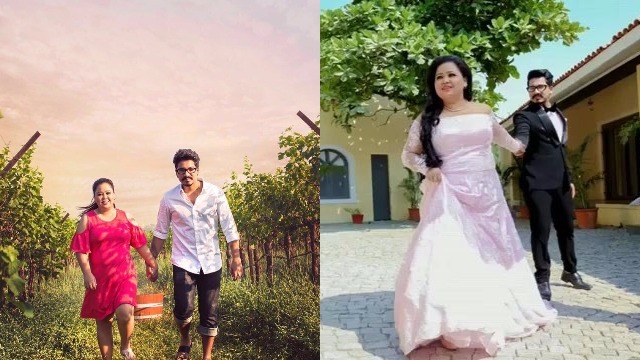 Bharti Singh and her fiance Harsh Limbachiyaa are releasing episodes which will talk about couple’s first time meeting to dating, love and fights and more. On Board Films have released the very first episode of Bharti Singh, Harsh Limbachiyaa’s wedding series. The fans are pouring their love and blessings to this cute couple. Bharti and Harsh decided to have web series called #BhartiKiBaraat, where the couple would upload their wedding details, functions, shots on YouTube for their fans and followers. The couple want their fans and followers to be part of their wedding, hence episodes are coming up. Other popular TV actors like Karan Wahi, Krushna Abhishek, Ravi Kishen, Sudesh Lehri, Rithvik Dhanjani, Anu Malik, Kishwer Merchant with her husband, Manish Paul and other celebs are seen in first episode giving some gyan to Harsh on how to keep his married life going and happy. Bharti and Harsh are already in Goa to kick start their wedding rituals from today i.e, Dec 01. Stay tuned, we will bring more details on #BhartiKiBaraat. Previous : Taarak Mehta Ka Ooltah Chashmah’s Daya Ben aka Disha Vakani Welcomes A Baby Girl!